TeenTitansGO! movie is coming to theaters on July 27th! 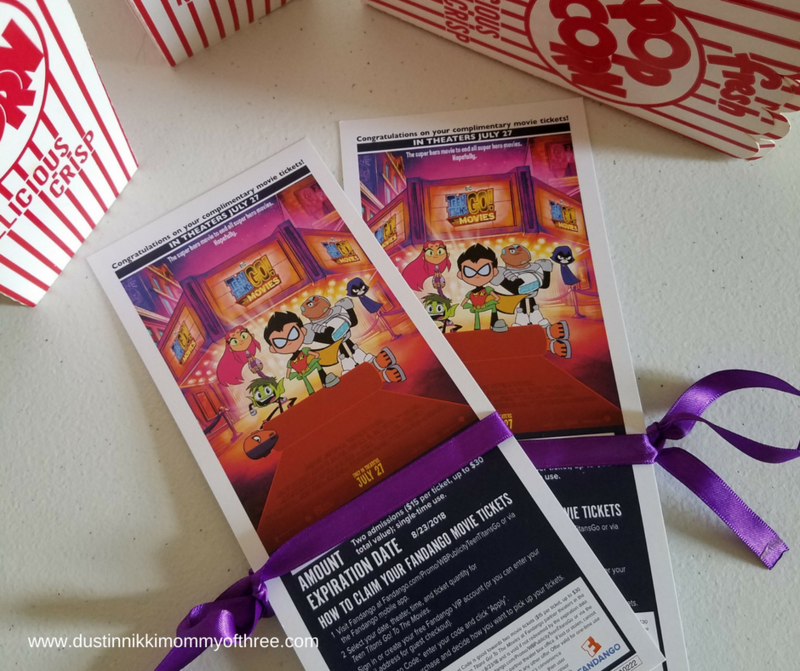 My kids love this cartoon and they are so excited about this movie and can’t wait to see it. When they are watching cartoons, I usually ignore the TV for the most part but I have watched this show a few times. I have to admit, it is a cool cartoon. The trailer for this movie looks pretty good too. It seems like there will be something in it for both adults and kids. Some of it looks pretty funny. I received a surprise package in the mail just the other day as a thank you for promoting this movie. The package included a TeenTitansGO! 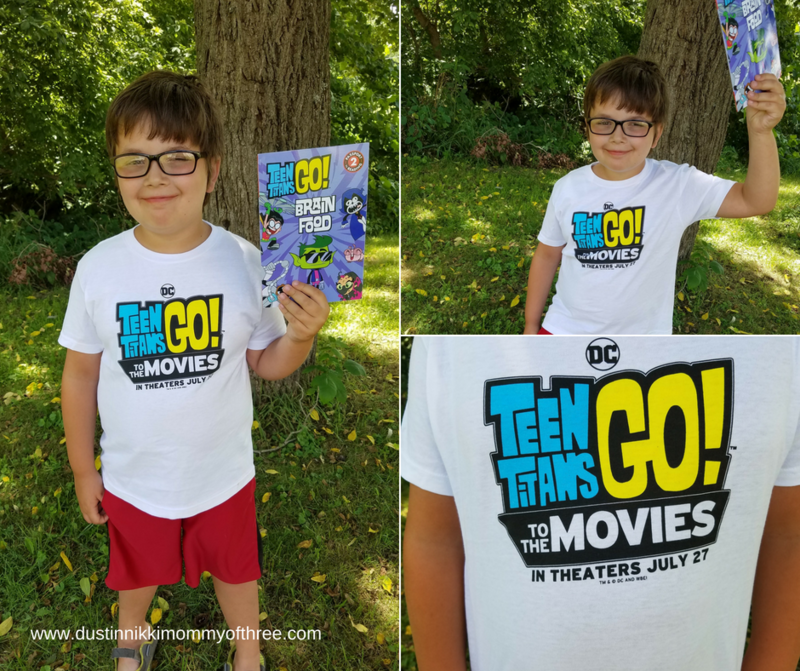 movie t-shirt – which my son immediately claimed! There was also a level 2 TeenTitans GO! story book. In the book, there is an asteroid headed to Earth. Beast Boy wants to help but he doesn’t think he’s smart enough so he grabs Raven’s spell book to try to make himself smarter. It doesn’t work and he doesn’t get any smarter. There are some things that go wrong but he eventually comes up with an idea all by himself! My 8 year old enjoyed the book. Sounds pretty exciting huh?! My kids think so! Make sure to check out the official movie trailer below! Are your kids looking forward to seeing TeenTitansGO! to the Movies? For more information about the movie and other fun stuff, be sure to check out the TeenTitansGO! Movie website! You can also check out the movie by visiting TeenTitansGO! Movie Facebook page. Now for more awesome stuff! 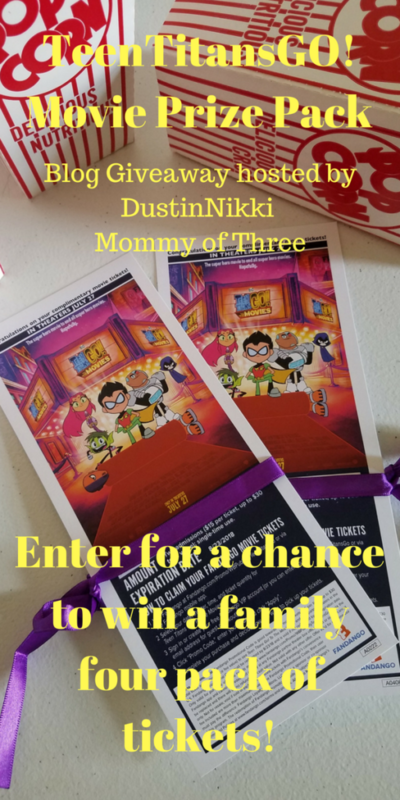 Along with my surprise package, I received a family four pack of movie tickets to give away to one my my lucky DustinNikki Mommy of Three readers! How cool is that?! so they can see TeenTitansGO! Movie when it arrives in the theaters on July 27th! Giveaway is open to the USA and D.C. See complete terms and conditions below. Terms & Conditions: Giveaway is open to the USA and D.C. Must be 18 to enter. Prize may be mailed or sent via email. Movie tickets will be redeemable through Fandango. Giveaway will end August 3, 2018 @11:59pm EST. Winner will be chosen using Rafflecopter powered by random.org. Winner will have 48 hours to respond after I, Nicole from DustinNikki Mommy of Three contact via email. If winner does not respond within 48 hours, a new winner will be chosen. No purchase necessary. Void where prohibited by law. DustinNikki Mommy of Three will be responsible for shipment to the winner(s) of this giveaway. DustinNikki Mommy of Three is not responsible for lost or stolen mail. This event is in no way administered, sponsored, or endorsed by, or associated with, Facebook and/or Twitter, Google, Pinterest or Fandango. Good Luck! Disclaimer: I was not compensated for this post. 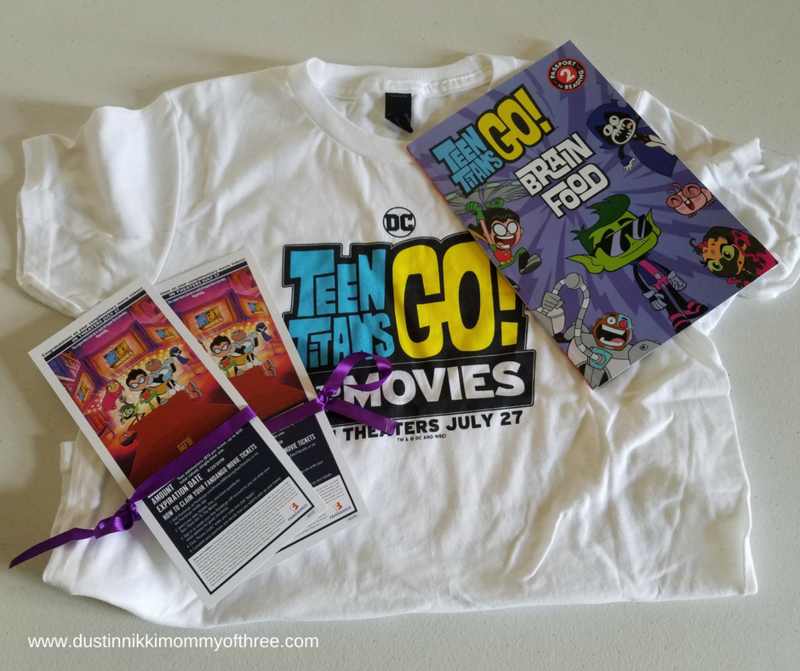 However, I received free product mentioned in this post from a representative of TeenTitansGO! Movie and Warner Bros. in exchange for my honest review. Brand is also sponsoring this giveaway. All opinions expressed in my review are 100% my own. My son loves Teen Titans. We have to go and see it! My kids love all the songs in the show, especially “Night Begins to Shine”! My kids like teen titans and want to see this! My daughter started watching this summer and enjoys the antics of the characters. 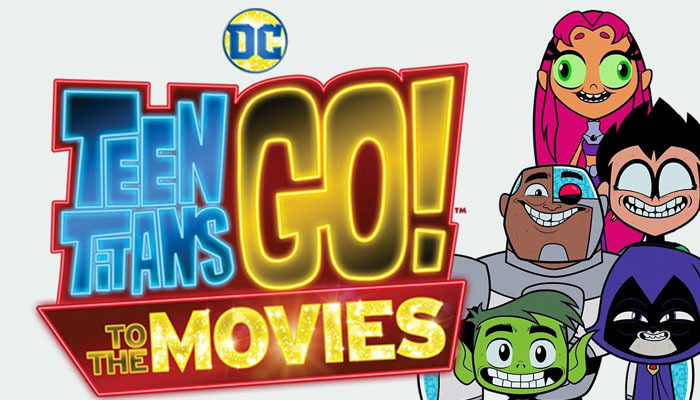 my son and i love watching teen titans go on TV and cannot wait to see this movie! My nephew loves Teen Titans. He watches the show all the time. He is very excited to see this movie. My family can’t wait to see this. We have watched the trailers more times than we can count. My kids ages 7 and 10 are teen titan fanatics. They are too excited to see this movie. Thank you for the chance to win ! My kids enjoy teen Titians and would love to see the movie. My nephew enjoys watching Teen titans, he is looking forward to the movie. My nephews love Teen Titans. We can’t wait for the movies. My sons like the comedy of Teen Titans. my kids have been wanting to see this movie so badly! I am fan of the old original series but I am giving this one a chance. The trailers have been pretty funny. Thanks for the giveaway and good luck to everyone else. My kids love teen titans, I still prefer the original to thenewest ones out but we even named one of my kids raven and she acts just like her. We are going to have to take them to see this for sure.